New funding means more support for Minnesota meat processing facilities. Last month, we told you about the recent bill passage that made it possible for inmates to obtain butcher licensures while serving time—not only providing them an opportunity to thrive after their sentences are complete, but also to support the small meat processing industry in Minnesota which is at risk of losing a majority of its workers in the next decade. 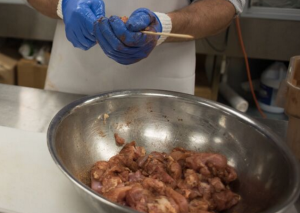 More progress recently came in the form of new funding for the Minnesota Department of Agriculture to hire more meat and food inspectors. The additional capacity means that small meat processing businesses will have more opportunity to expand their businesses through expansion or diversification. It also means that existing inspectors—previously spread too thin across the state—will be more available for technical assistance and support the businesses in compliance when new regulations are implemented. To date, the Minnesota Department of Agriculture has already added three positions—with the hope to add up to two more. The new inspectors are located in the southeastern, central, and metro regions of the state. If you have a progress story you’d like to report for coverage in a future Minnesota Food Charter publication, contact us.